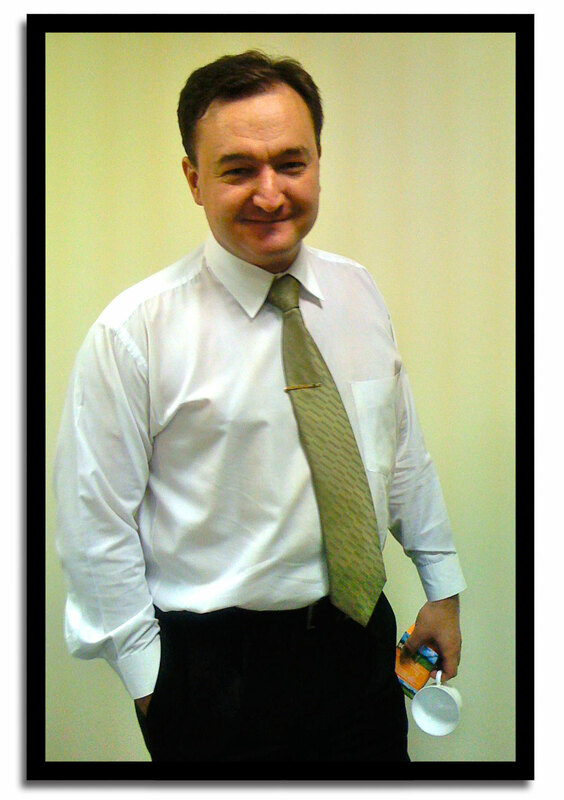 Why Europe Needs A Magnitsky Law » Who is Sergei? The 16th of November 2013 will mark the fourth anniversary of the murder of Sergei Magnitsky in Russian police custody. His death has been the most well documented case of abuse in Russia in the last 25 years. It has also become my life’s mission to bring justice to this situation, and to shine light on similar incidences of human rights abuse and corruption that happen in Russia every day. It is very unusual for a businessman to become a human rights campaigner, but the horror of this story and the power of Sergei’s bravery were so compelling that I really have had no choice. The story of Sergei Magnitsky began in the summer of 2008, when Sergei discovered a massive $230 million tax refund fraud orchestrated by corrupt Russian government officials. Most Russians would have turned a blind eye, because exposing corruption in Russia is an extraordinarily dangerous activity. But Sergei was not like most Russians and had a character that required him to behave in an honest way. Sergei was not just a brilliant professional, but also a subtle, witty, competent and kind person. If you came to Sergei Magnitsky for help, he would do whatever he could in the most sensitive and sympathetic way. When the Russian authorities started to persecute me and my colleagues, Sergei stepped in and supported us at every step. Heartbreakingly, it was his advocacy for me and his intolerance of corruption in Russia, which caused him to be murdered by the Russian state. In late October 2008, Sergei chose to testify against the officials involved in the $230 million tax theft. One month after his testimony, he was arrested by some of the same officials he had implicated. It was a particularly brazen arrest because it came at the same time that President Medvedev had announced his fight against “legal nihilism”. In my mind, there could be nothing more legally nihilistic than arresting a whistle-blowing lawyer who had uncovered a massive government corruption scheme. Sergei was arrested on entirely trumped-up charges and the materials used to justify his arrest were fabricated. My first reaction was that there were so many legal errors that simply pointing them out to the court would immediately free him. Unfortunately, dozens of legal filings did nothing to change his situation. It quickly became obvious that he was being kept as a hostage. Without any success freeing him from inside of Russia, we appealed to various Western organizations to help free Sergei from outside of Russia. We went to the Parliamentary Assembly of the Council of Europe, the International Bar Association, the Law Society of England and Wales, the UK Foreign and Commonwealth Office, as well as a number of human rights organizations. They all highlighted his case and asked for him to be freed. But even with that international pressure and exposure, the Russian government refused to budge and kept him as a hostage. While he was in prison, Sergei was put under extreme pressure to get him to plead guilty and testify against me. They put him in overcrowded cells with a shortage of beds to impose sleep deprivation. They put him in cells with no heat in the middle of December so he nearly froze to death. They put him in cells with no toilet, just a hole in the floor where the sewage would bubble up. After six months of this nasty treatment, he lost 20 kilos, developed severe abdominal pains, and was diagnosed with pancreatitis and gallstones, requiring an urgent operation. As his health went into a downward spiral, the authorities refused him all medical care. In spite of all this, Sergei refused to perjure himself and bear false witness. For him, his integrity was more important than his physical security. As I look back at what happened, I wish he hadn’t been such a principled man. I was safe and outside Russia, while he was in pain and in prison. If he had chosen comfort and freedom over his integrity, nobody would have faulted him, and most certainly not me. But that’s not who he was. In addition to refusing to give in to the pressure of his captors, he carried on trying to expose the true criminals. On 14 October 2009, he gave another testimony from jail against the officers involved. It became clear to his oppressors that he was not going to be broken, and he was going to expose them all in an open trial. In mid October 2009, the Russian Interior Ministry formally indicted Sergei and announced their intention to take his case to court. At that point, I’d given up any hope that he would be freed, and I started preparing myself for the worst. In my mind, the worst-case scenario was that Sergei would be sentenced to six years in prison, and I was going to have to come to terms with the fact that an innocent man was being locked away for six years solely because he was my lawyer. As things turned out, a six-year prison sentence would not have been so bad compared to what ended up happening. On the morning of November 17, 2009, I received a call telling me that Sergei Magnitsky was dead. He had been beaten the previous night by eight riot guards with rubber batons, while he was in critical condition with pancreatitis. This news was so far beyond my worst-case scenario, it is indescribable how painful it was for me. It was literally like a knife going into my heart. Sergei Magnitsky died at the age of 37, leaving behind a wife and two children. The criminals who killed Sergei had nothing against him personally, except that he was my lawyer and they needed a hostage. I am haunted by the fact that Sergei would still be alive if he had not worked for me. That burden sits on my shoulders every minute of every day. The only peace that I can find is making sure that the people who killed him face justice and that his legacy is one that will save the lives of others. That is why I have dedicated my life to getting justice for Sergei. In an ideal world, justice would be done in Russia and the people who killed him would face prosecution in Russia. But that has not happened. Every single person who played a role in his false arrest, torture and death has been exonerated. Many have been promoted, and some have received honors and medals. To add insult to injury, the Russian government was not satisfied just killing Sergei Magnitsky, it then posthumously prosecuted him in the first ever posthumous trial in the history of Russia. It is clear that there is no possibility of justice inside Russia. So our only choice is to seek justice outside of Russia. But what kind of justice can one get outside of Russia? The crimes committed against Sergei Magnitsky have no jurisdiction in most foreign courts. However, there is one type of justice that is possible: banning the travel and freezing the assets of those involved in Sergei’s death. The people who committed this crime did so for money. Most human rights abuses in Russia are committed in order to steal money, and most of the people who steal the money want to keep it safely in the West. They want to travel to the West. They want to send their children to school in the West. If we can block access to the West for the officials who killed Sergei Magnitsky and those who commit other similar abuses, it may not be full justice, but it is a meaningful consequence and much better than the absolute impunity which exists in Russia today. The concept of visa bans and asset freezes has already been adopted in the United States. We succeeded across the Atlantic and it is now time to have a Magnitsky Law in Europe. The corrupt officials who commit these crimes have houses in the South of France, bank accounts in Germany, and kids in English public schools. Passing a European Magnitsky Law would affect the corrupt Russian officials in the most profound way because of their interests in Europe. Some have argued that it is better to do nothing in this case and others like it because it would upset the Russian government. They point to the fact that the Russian authorities have already started retaliating against the US for passing Magnitsky sanctions. The Russian government has banned adoptions of Russian children, frozen certain types of commerce between the US and Russia and put reciprocal sanctions in place. But failing to challenge Russia on Magnitsky’s murder and other similar Russian atrocities for fear of retaliation would be the exact wrong thing to do. To quote Andrei Sakharov: “It would be tantamount to total capitulation of democratic principles in the face of blackmail, deceit and violence.” It was true when Sakharov wrote his famous letter to Congress in 1974, when Russia was trying to block sanctions against the persecution of Soviet Jews, and it remains true today. As for me personally, I have received death threats, legal threats and faced a highly orchestrated campaign of intimidation from the Russian government to silence my calls for justice for Sergei Magnitsky, but I will not be silenced. Sergei challenged the corrupt Russian authorities from a far more precarious position, and he paid the ultimate price. I think we all owe it to him to get justice, and a European Magnitsky Act is the best way we can do that.